At Lucky Orange, we know what branding means to a business. That's why we offer the complete Lucky Orange experience in a customizable white-labeled package for you and your organization. Below you'll see how to upload your company's design assets to help showcase your brand throughout the product, and make it feel like an extension of your existing offerings to clients. Whitelabeling is a great way to expand your company's product offering to your clients. Often times this can be done as an value added service you provide, or even packaged as an additional revenue generator! Our whitelabeling allows you to create your own log-in domain, upload your branding to the dashboard and tool, and pass on whatever costs you want to your clients. Additionally The white label tracking code does not reference Lucky Orange. Your can customize the dashboard and tools offered on a site by site basis. This means when you add a new operator or site to track, you can hand pick customized settings, so you can provide limited feature sets (ie: Recordings, Heatmaps, Chat, etc. ), or provide access to all. Plus, clients will be able to log in to their site dashboard only. They will not see or be able to access any other client site. But as the master account holder, you and your team can have acess to all client dashboards! The typical cost of whitelabeling is 4X a plan, but we can do custom plans that have as many sites and pageviews that you need to track. Once you have selected a plan and have an active subscription, we can enable whitelabeling for your account and you will have access to all the below Whitelabel Customizations. Note: If you don't have a white label account with Lucky Orange, contact us to learn more. Next, select the My Account menu item. Once on the Account Info page, locate and select the White Label item in the sidebar. This will display your White Label settings. The Login Page logo is displayed above the form on the Login page. 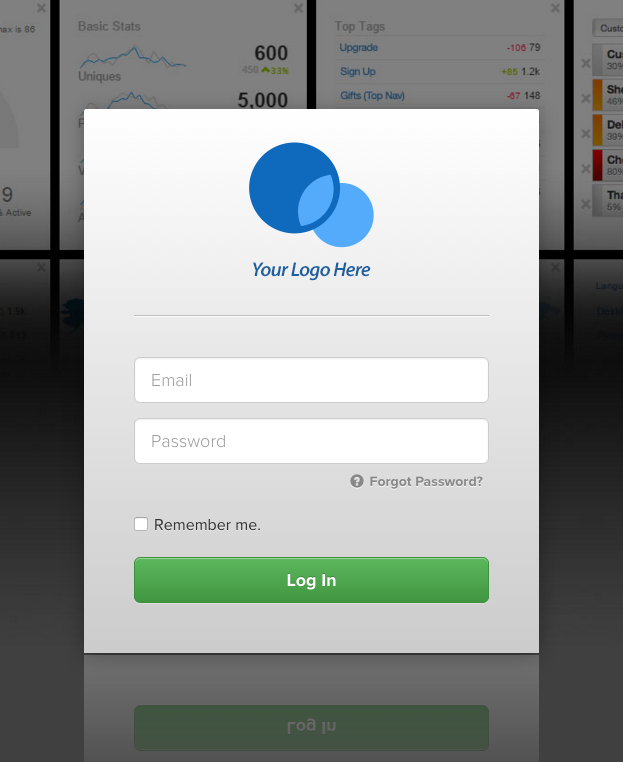 Users will see this when logging in, so make sure it's inviting. While no maximum width is specified, you'll get best results if your image's width is around 300–400 px. The height, however, must be 220 px or below. If your image is taller than 220 px, it will be resized proportionally to fit. This may lead to undesired results, so try to stay below or right at the maximum height. The Favicon is displayed in multiple places. Web browsers generally add the Favicon to windows' titlebars and/or tabs, but you'll often see them other places as well, such as next to a site's name in a bookmark list. Because the image is utilized in so many locations, take the time to make sure yours looks great in an address bar. Favicon sizes can vary, but the standard size is 16 x 16 px. For best results on HiDPI (high resolution) devices, you should upload an image sized 32 x 32 px. Again, if your image exceeds these dimensions, it will be scaled to fit. And unlike with larger images, scaling to such small dimensions can make your image look pretty … bad. So try to keep it small from the get go for best results. 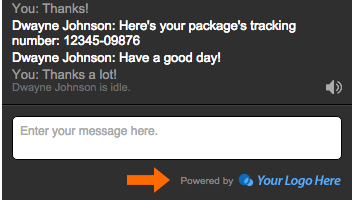 Finally, you'll see an upload field for the Powered-By logo. If you will not be using chat or polling, you can skip this field. However, you might want to upload something anyway in case you use the feature in the future. This image is displayed at the bottom of all public-facing chats. That means your users and/or customers will see this image in all its glory, so you'll want it to really represent your brand. The maximum image height is 16 px, and as with the Login image, the width can vary. For best results, however, you should try to keep its width in the ballpark of 200–250 px. Once you've selected an image, you're all done! When the upload completes, you'll see your image in the preview well next to its respective upload field. Your changes should propagate throughout the system immediately. If, however, you've uploaded an image, and you're not seeing it update after awhile, please let us know. Lastly, you can change your images at anytime, so don't be afraid to update that aging logo. We've got you covered.